This year, we have had quite a bit of trouble keeping the 1959 Topps in stock. We're not exactly sure why the demand for 1959 Topps baseball cards has increased so dramatically, but this year is definitely an office favorite just because the cards themselves are so attractive. 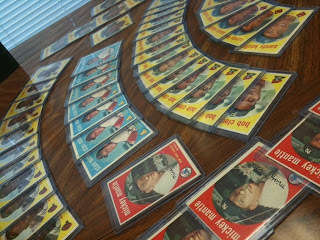 We just broke two sets, so we have the largest inventory of 1959 Topps that we have ever had. 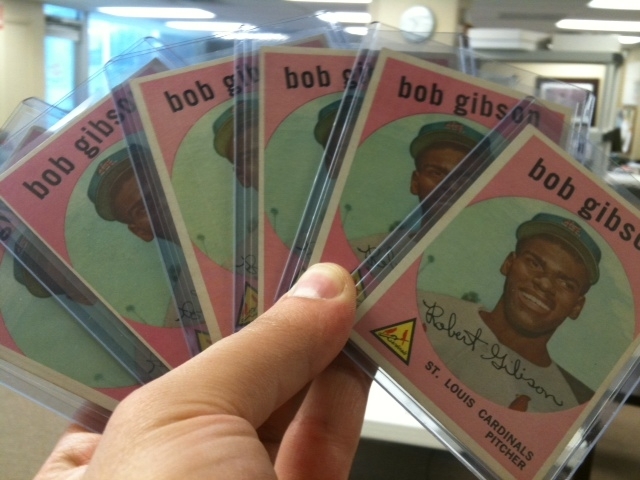 One of the most popular cards from the 1959 Topps set is #514 Bob Gibson rookie card. We currently have 6 Gibson rookies in stock. In 1959, Gibson made the Cardinals roster, but was sent down to their Omaha affiliate shortly after the start of the season. Gibson would continue to split his time between the Cardinals bullpen and minor league clubs until 1961. His 1959 card, however, has the distinction of being one of the few pink rookie cards. One of the other notable cards in the 1959 Topps set is #550 Roy Campanella Symbol of Courage. Campanella, a teammate of Jackie Robinson and a pioneer in breaking the color barrier, was paralyzed in a car accident in the winter of 1958. In the 1959 set, Topps decided to memorialize his prolific career as a catcher for the Dodgers with this card. Click here to see our entire selection of 1959 Topps baseball cards.